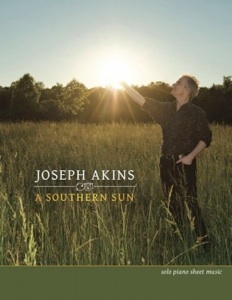 A Southern Sun is the companion sheet music book to Joseph Akins’ 2013 album by the same name. All fourteen pieces from the recording are included plus a second version of “An Inspiration” transposed into an easier key signature. Joseph did the transcriptions, which were then proofed and edited by myself, Pam Asberry, Greg Maroney, and Neil Patton (what a team!!!). This book provides a wonderful assortment of playing styles and genres of music from slow and dreamy to spirited and jazzy. 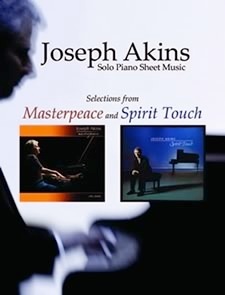 Most of the playing challenges come from the timing in some of the improvised passages, but pianists at an upper-intermediate to early-advanced playing level should have little problem with this music. The pieces are so much fun to play that a little extra effort here and there will be well worth it! Playing instructions are clear and concise with suggested pedal markings and metronome settings. 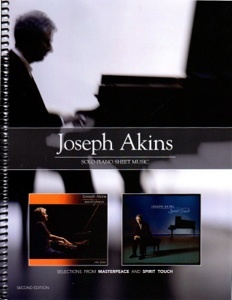 The book is spiral-bound with full-color front and back covers and the scores have a nice roomy layout and are printed on a sturdy paper stock. There are a few octave chords, but most of the music is single notes and intervals of an octave or less. There are a couple of pieces written in more challenging key signatures, but most are not complicated (see below). This is one of my favorite songbooks from 2014 and I highly recommend it! 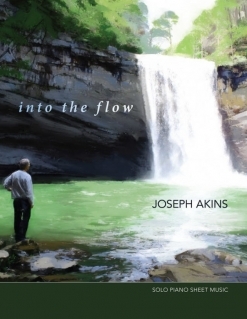 It is currently available in the printed version and as a download from josephakins.com.